The misery parade for DC’s extended universe has continued at the hands of ArtSpear Entertainment. After Batman v Superman: Dawn of Justice received a heavy dose of criticism for being too doom and gloom, Zack Snyder and company responded with a Justice League trailer at 2016 San Diego Comic-Con International laden with humor and didn’t take itself too seriously. Although the trailer was a noticeable success for DC and Warner Bros., that didn’t stop ArtSpear from releasing a hysterical spoof entitled Jackass League. 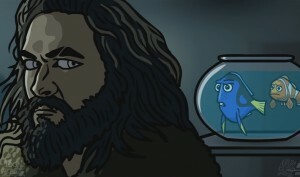 From a reference to The Lord of the Rings to an unfortunate fate for Pixar’s Nemo and Dori, this chalk full of humor that any good DC fanboy or fangirl would enjoy. Maybe Snyder can follow suit and have us laughing in our seats next year when Justice League lands in theaters everywhere. Starring Ben Affleck, Henry Cavill, Gal Gadot, Ezra Miller, Jason Momoa, Ray Fisher, Amy Adams, Jesse Eisenberg, Amber Heard, Jeremy Irons, J.K. Simmons, Willem Dafoe and Julian Lewis Jones, Justice League hits theaters on November 17, 2017.